If you are the primary caregiver for a senior loved one, there may be times when your duties become overwhelming and you need the rest of your family to pitch in and help. Use the tips below to convince your family members to help with the care, medical decisions, and other roles associated with caregiving. If you do not know what your caregiving responsibilities are or when they need to be taken care of, it is going to be hard to convince other family members to help out. Therefore, you should have a good understanding of the responsibilities, create a schedule, and present this information to your family members. When you hold a family meeting, your family members will be more supportive if the duties are explained clearly and split up equally. If you take each family member’s limits into consideration, he or she may be more likely to help with caregiving. This includes financial limits, such as having to travel a long distance to provide care, as well as emotional, physical, and mental limits. When dividing up the caregiving duties, always try to assign them based on these limits. This helps ensure each family member provides your loved one with the best elderly care in Harrisburg possible. When deciding which family member will handle a specific duty, be sure you consider what he or she is good at. For instance, if one family member is more comfortable speaking with doctors and other medical professionals, it would be easier to convince him or her to help if you put him or her in charge of your loved one’s medical affairs. This includes making medical decisions and keeping the family up to date on any changes. It is easier to convince family members to help with caregiving when you allow them to use their skills and strengths. Sometimes caregiving can seem overwhelming to other family members, even when responsibilities are split up, which is why you should consider hiring a professional caregiver. You can also consider respite care in Harrisburg for times when you and the rest of the family need a break. Knowing you have a backup plan in case of an emergency or for when everyone needs some personal time could help your family members feel less stressed and more eager to assist with the caregiving. Without the right assistance, it can be challenging to provide the type of home care that can keep a senior healthy and safe. 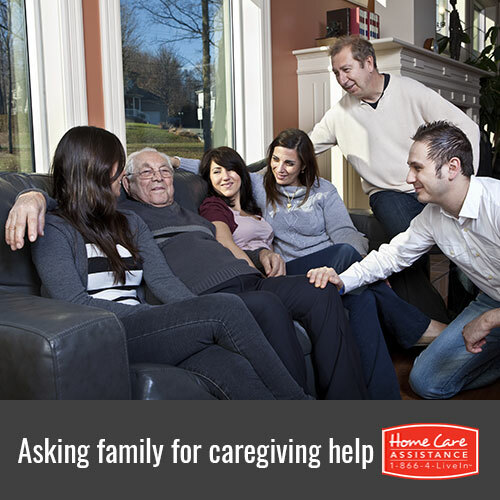 If your family needs help caring for your loved one, turn to Home Care Assistance. Our part-time and 24-hour caregivers in Harrisburg are expertly trained to assist seniors with a wide variety of daily tasks, including exercise, healthy meal prep, and bathing. We also offer specialized care for seniors with Parkinson’s, dementia, and Alzheimer’s. For more information on our senior care services, call one of our experienced Care Managers at (717) 540-4663 to schedule a complimentary consultation.